The Selle Italia Flite Tekno Flow saddle is an updated classic that's lost weight and some of the usual depth of cushioning, and gained a slightly flatter and wider shape. The shell is carbon-fibre with a significant amount of flex to it, especially around the central cutout, while the rails are lightweight CarboKeramic which, you'll not be too surprised to find out, is carbon-fibre with a ceramic coating to protect the rails from the clamp. There's less depth to the padding than there is on other Flites, resulting in a firmer feel towards the nose when you climb aboard. Whether that's right for you is purely a matter of personal choice. Don't get the idea that this saddle is harsh; it isn't. But some people will certainly want more cushioning. Our Flite Tekno Flow hit the road.cc Scales of Truth at 137g, a little higher than Selle Italia's claimed 125g but still very light for a saddle of this kind. To put that figure in context, we've tested a Selle Italia Turbomatic Gel Flow Team saddle in the past that weighed 257g, while the Bontrager Team Issue saddle we reviewed last year was 211g. The saddle shape is slightly flatter than normal for a Flite, and a little wider. I have a Flite Gel Flow here from a few years back and the widest part of the nose is 37mm across. The widest part of the Flite Tekno Flow's nose is 43mm. Can you feel that difference? Just about. I can't say it really bothers me either way but you're aware that the Flite Tekno Flow's nose is a touch wider. The shell is fairly wide (145mm) towards the rear of the saddle too, although the padding and cover don't reach right to the edges or to the back. Check out the picture and you'll see what I mean. The cover is bonded to the top of the shell back there so, despite the difference in size, the actual seating area is about the same as that of the Flite Gel Flow I mentioned. That bonding looks like it's going to last. At least, I've been using this saddle for a few weeks over the wettest, dirtiest time of the year and it hasn't shown any signs of coming unstuck. Overall, this is a lightweight saddle with a fairly shallow amount of padding, but the flex in the shell, especially through the central section, means it feels firm rather than harsh. The price, though – that's a hard one to swallow. You don't need me to tell you that £313 is a lot of money to spend on a saddle. The Flite Tekno Flow is almost twice the price of the next most expensive Flite, and getting on for four times the price of the cheapest. A quick look back through the archive shows that this is the most expensive saddle we've ever reviewed. Whether it's the right buy for you depends on how much you value shaving off the grams. Oh, and with a price tag this large, you'll want to be absolutely certain that the saddle fits you and is comfortable before splashing the cash. Head along to a Selle Italia dealer and get measured up using their idmatch system http://www.selleitalia.com/en/idmatch/discover-idmatch/ system to be sure. The excelllent combination of comfort and aesthetics is what distinguishes this timeless legend from so many other saddles. Thanks to the valuable ergonomic contributiojn of IDmatch it's an even better buy. The wider and flat seating surface makes for a better overall distribution of pressue. Thin padding adds to the comfort for an ultra-slim profile. This is very light for a saddle with padding. It's always a personal thing but the flex in the shell meant that I felt comfortable despite little depth to the padding. As usual, there's less flex in the nose so that section feels firmer than the rest of the saddle. It's certainly expensive, although value isn't the same thing. 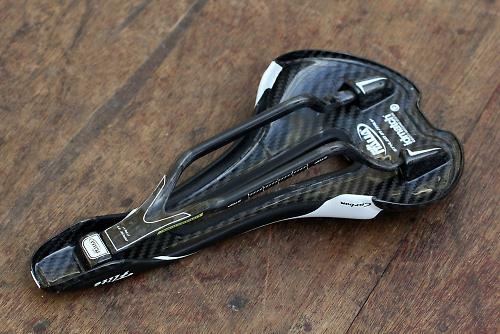 Even for a top-end saddle, this is a high price. Value certainly isn't its strongest suit. I can't really give it higher than a 4 for value. It's a great saddle, no doubt about that. The thing that most of us care about most with a saddle is that it feels good. This one feels good to me. Would you consider buying the product? I couldn't justify spending this much on a saddle. Would you recommend the product to a friend? I'd recommend it to weight weenies with loads of cash. In terms of performance, this saddle scores highly. It's just the mammoth price that drags the overall score down. Good review, and the price is the main sticking point. The Italian saddle designers have priced themselves out of the market with Specialized BG clones. Why would I pay 3 times the price for a Romin which is light, super comfy and a bargain by comparison? Footnote (or Assnote!) Don't be fooled by Carbon rails either. I went straight back to Ti. The ride quality is far superior. I am far from your Aldi cyclist, I run £100 seats without batting an eyelid. this though is totally insane. I had a Romin Evo Expert, I didn't really notice the carbon rails...in fact it was OK until the shell cracked. I returned it under warranty to sit with the other saddles which were not quite right. I usually test a saddle on a turbo trainer, as you don't move much, so a bad saddle with let me know quite quickly...2 hours on a turbo trainer is good for 6 hours on a 100 miler. Ahahahahahaha... and breathe... ahahahahahahaha!! £300 for a saddle! Good grief. Presumably those who'd buy this would also spend £160 on a pair of Rapha gloves. I do like S I saddles, been using them for 30 years, but this is crazy money. It weighs "137g, a little higher than Selle Italia's claimed 125g". So that's nearly 10% more than the advertised weight. Don't they have scales, is the quality control that bad, or are they consciously trying to cheat? Whichever, it's not acceptable, and certainly not at this stupid price. I am the developer/designer of the Selle Italia saddles and the Specialized saddles you mention (and many more). Sure interested in your option how you think they are clones of the BG saddles. The price and materials are always debatable of course and heavily depending on personal preference, production location and business approach. We choose to build this saddle 100% in Italy. We choose to engineer/design/produce this saddle 100% in Italy, that is the reason why it's price higher then then some other brands. We understand that that may not be for everyones pocket.